Once you have your web host configured, you need to upload your website’s files or install your CMS software. The easiest way to do this is through File Transfer Protocol (FTP). 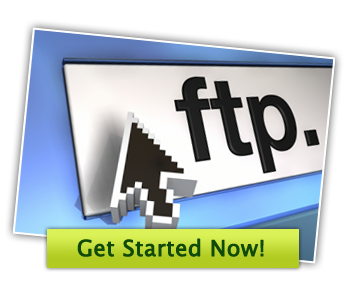 FTP makes it so simple to send files to your hosting account. Alternatively, you can use the file manager included with your website control panel, but it has its limitations. With FTP, you’ll be able to instantly send files to your server all at the same time as opposed to individually. The only catch is you have to download and install an FTP browser. But trust me, once you have this, you’ll never go back to your control panel file manager! FTP is a standard network protocol used only for transferring files. If you understand that HTTP is for transferring web documents like pictures, html files, sound, video, etc. then you can see the relation. It was created back in 1971 as a way to promote the sharing of files, computer programs and other data. It also streamlines the upload process by using multiple connection methods so the user doesn’t need to know what filesystem they’re connecting to; the software automatically detects it and makes applicable adjustments. It utilizes a client-server configuration where a server has been setup on a remote site and the user connects to it via an IP address or domain name to begin a transfer session. More than likely, connecting to your server will require a connection to FTP. (yourdomain).COM using the port number: 21. Of course, different configurations will yield different settings. Inherently, FTP is not secure and therefore, a user on the same network as the FTP session could use a packet sniffer program to see passwords, usernames and data as it’s being transferred. Today, FTP sessions can be used with the addition of an SSL certificate over the FTPS protocol. Most FTP software can also handle SSH connections. You can even set up your own FTP server at home and have access to all of your files whenever you need them. I remember years ago (and long before torrents), FTP servers were the number one way to download software, although some of it wasn’t exactly legal! Globalscape CuteFTP Pro – This is my favorite and I’ve used it for over 10 years. The Pro version is the way to go because it offers SFTP, FTPS, HTTPS and SSH connections. Normally it costs $59.99, but it’s worth it. However, I noticed they added an academic licensed version that you can buy for only $3! SmartFTP Pro – I haven’t used this one myself, but at only $49.99, its not a bad price. Again, I’d recommend the Pro version for the added security features. They also have an Ultimate edition that includes a terminal client. I wish CuteFTP Pro had this feature! BulletProof FTP – This recommendation really only made this list because I used BulletProof FTP Server for a number of years and I loved it. This program is only $34.95, but it can hold its own against the others in features. Once you install your client of choice, all you have to do is plug in your server’s IP address or domain name, your username and password and you’re connected! You’ll instantly have access to the location of all your website files and you can begin uploading your content. If you’re not sure about your server settings, contact your web host to get the applicable information.